This collection of original essays breaks new ground by examining the dynamics of ethnic politics at the local level, rather than following in the footsteps of many previous studies which focus on the macropolitical level of states and nations. Governance in Ethnically Mixed Cities is based on extensive fieldwork and local observation, providing perspectives from a range of academic disciplines including Political Science, Geography, and Anthropology. It covers a variety of geographic areas from the Middle East (Kirkuk, Haifa, and Tel Aviv-Jaffa) to Europe (Mostar, Bolzano, Toulouse, and Florence), Central Asia (Osh in Kyrgyzstan) and the United States (Durham, North Carolina). 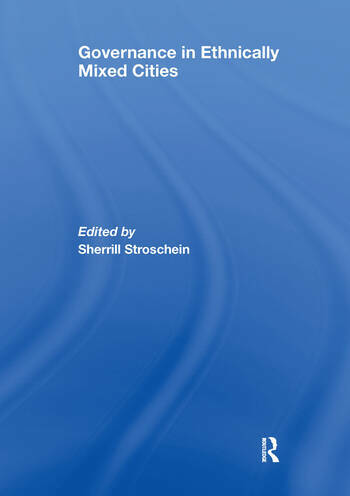 In spite of the variety of disciplinary approaches and geographic diversity of the case studies, the contributing authors uncover a number of common elements of local ethnopolitical dynamics in mixed cities: the power of informal institutions, the effect of numerical balances between groups on local politics, and the significance of local competition for material and symbolic resources. Each of these areas provides a promising avenue for future research. Dr. Sherrill Stroschein is a Lecturer in Politics in the Department of Political Science, University College London, and Program Coordinator of the MSc in Democracy and Democratisation.